Hold the front page! Advertisers will be able to buy the top ad in every national newspaper in print and online in one go for the first time. An advertiser can book the first print ad that appears in the physical newspaper and take over the homepage of the website of all the titles simultaneously for one day and reach 21 million adults across the UK. More than a dozen titles from red-tops to broadsheets are supporting the initiative, called Impact, in a sign that publishers want to be more collaborative. The Times, Daily Telegraph, The Guardian, i, Daily Mail, Daily Express, The Sun, Daily Mirror, Daily Star, Metro, Evening Standard and the online-only Independent are all making their inventory available for Impact. Reach, the parent company of the Daily Mirror, Daily Express and Daily Star, is including its "Big City" package, which includes six regional titles including the Daily Record and Manchester Evening News, plus another 18 regionals. The Financial Times is not involved. An advertiser need only contact one of the publishers to block-book the advertising package. "It's truly simple because it's only one phone call," Vanessa Clifford, the chief executive of Newsworks, the trade body for the newspaper industry, said. "Collaboration should always be multi-faceted and adaptable and Impact is a fantastic example of news brands' collaboration – creating a package that not only delivers 21 million adults on one day, but 21 million adults in a quality environment that we know will deliver results and profit for advertisers"
The news groups came up with the idea during the launch of Pamco, the new joint industry measurement tool that combines de-dupliacted, print and online readership figures, which debuted in spring 2018. "Impact was born out of wanting to give agencies and advertisers a simple way of accessing this phenomenal quality and engaged audience, in one simple step," Clifford said. Impact reaches 21.2m adults across print and online at a frequency of 2.43 times in a day, meaning it has 51.4m impacts, based on Pamco data. Clifford, who announced Impact at the Newsworks’ effectiveness summit in London, said the package would cost an advertiser £375,000 and compares favourably with TV, out of home and radio on reach and price. She conceded that Impact was not going to appeal to all advertisers. "You’re not going to need it for everything but it’s there," she said. "It’s a step in making it easier to reach that audience in just one phone call, it’s a first step in a collaboration that has never been done before." News publishers have been fierce rivals in the past but have recognised the need to collaborate because of the collapse of print ad revenues and the rush of money into Google and Facebook. 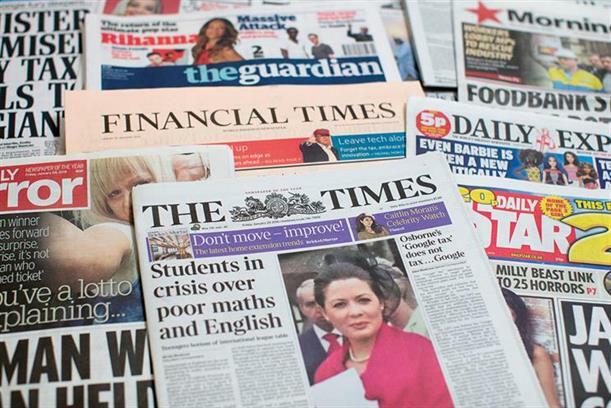 UK national newspaper ad revenues have almost halved from £1.4bn to £750m between 2011 and 2018, according to Group M.
Collaboration has been slow as publishers tried and failed to pool ad sales in a series of initiatives, called Project Juno, Rio and Arena, over the last two years. However, News UK, the owner of The Sun and The Times, Telegraph Media Group and Guardian News & Media launched The Ozone Project, an advertising platform that offers joint ad sales of their digital display inventory and audience data across their four titles for the first time, in June 2018. Editor's note: The total audience figure of 21m, cited by Newsworks, does not include Reach's regional titles.